Info on Gold, Silver, Gemstones, Precious metals and so much more goodies! Jewellery and the many components in jewelry-making can be from a whole wide range of jewelry materials - some of them surprising, unexpected, and dramatic. The most widely employed materials used in jewelry making field, especially for use in manufacturing jewelry findings and chains are metals. They can be base metals or precious metals. Many of the budget jewelry findings are made from iron or alloys. These jewelry materials are ideal for practice: you don't have to worry about wasting more expensive findings that might be made of precious metals, like sterling silver or gold. There is also intrinsically wrong with using the budget findings even though many jewelry makers then to scoff at their use. Everything has their place and some of the iron plated or alloy plated metals are actually of high quality. I have known of well known and successful jewerly makers who use a combination of media, including iron/alloy quality plated findings and chains. However it cannot be denied that there is an innate pleasure in working with precious metals and it is very much a progression status - both of one's self confidence and perhaps, of one's budget and the quality of clients one would like to serve. This also holds true for the jewelry materials that make up our beads. Most beginning their journey into jewelry making will find great delight in the price as well as the variety of beads that are made up of differing materials from wood, glass, crystal, gemstones, shell, bone, resin, plastic, and so on. Again as their confidence, expertise, and craftmanship progresses, many artisans move onto the more expensive materials like Swarovski crystals, pure gemstones, Austrian crystals, pearls. I think there is a place for everything - it all depends on who/what you intend to use them for. I personally love my "cheapies" because it allows me a wide playing field in terms of materials and also in encouraging me to attempt untried designs. And also, for the price, they are ideal as starters for kids to spark their creativity while having fun. There are some truly remarkable jewerly artisans who specialize in mix media - and these materials can include bottle caps, scraps of plastic, cast off fabric, nuts, bolts, nails, and reclaimed wire. At the end of the day, your imagination and skill is the true mark of a glorious piece of work. Jewelry materials used in the creative process of jewelry making can come loaded with cultural meaning - from gold, leather, sterling silver - they can share of sense of what is considered desirable, luxurious, posh, and chic. 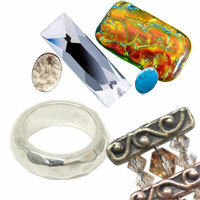 There are also many innovative and interesting techniques that are used with a mix of materials to produce fantastic items that are a class of their own, like Enamel jewelry components, dichoric beads, vermeil gold, and much more.